Underwater communication has a great importance in either industrial, military or for scientific purposes. The applications of underwater communication such as pollution monitoring, underwater surveillance and collection of scientific data from the bottom of the ocean require specific development of devices. In order to design these crucial devices for such activities, an accurate characteristic of water involved should be noted. The velocity of signal propagates in underwater is different from the speed of light in free space and closely related to complex permittivity. There are few types of water bodies such as rivers, streams, pond, bays, gulfs and seas where each of them possessed different characteristics. In this paper, the main focus is to determine the water bodies’ characteristics by using material characterization method. 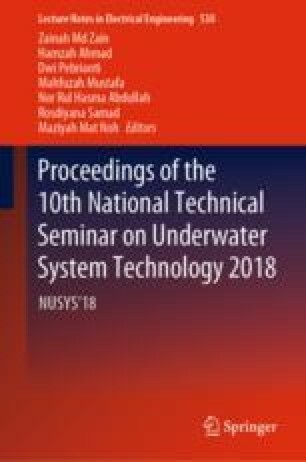 This paper provides the characterization of the different water bodies such as tap water, river water, sea water and lake water where the complex permittivity are determined by using resonant method. Estimated complex permittivity of different water are in good agreement with existing method; the error is below than 6%. The present method shows a great potential to be used in characterizing wide-variety of liquid samples. The work was partly supported by the Research and Innovation Department, Universiti Malaysia Pahang (grant number RDU170370).